Background : The aim of this study was to evaluate the antioxidant role of zinc (Zn) against radiation-induced cataract in the rat lens after total cranial irradiation with a single 5 Gray (Gy) dose of gamma irradiation. Materials and Methods : Twenty-one Sprague-Dawley rats were used for the experiment. The control group did not receive Zn or irradiation but received 1-ml saline orally plus sham-irradiation. The irradiation (IR) group received 5 Gy gamma irradiation to the total cranium as a single dose plus 0.1 ml physiological saline intraperitoneally. The IR plus Zn group received irradiation to total cranium plus 10 mg/kg/day Zn intraperitoneally. Biochemical parameters measured in rat lenses were carried out using spectrophotometric techniques. Results: Lens total (enzymatic plus non-enzymatic) superoxide scavenger activity (TSSA), glutathione reductase (GRD), and glutathione-S-transferase (GST) activities significantly increased in the IR plus Zn groups when compared with the IR group. However, TSSA, GRD and GST activities were significantly lower in the IR group when compared with the control group. Lens non-enzymatic superoxide scavenger activity (NSSA) in the IR plus Zn group was significantly increased compared to that of the IR group. Lens xanthine oxidase (XO) activity in the IR group significantly increased compared to that of both the control and IR plus Zn groups. Conclusion : Zn has clear antioxidant properties and prevented oxidative stress by scavenging free radicals generated by ionizing radiation in rat lenses. Background: Xuanfu Daizhe Tang (XDT) is a classical traditional Chinese medicinal prescription that has been widely used for treating digestive system illnesses for hundreds of years. 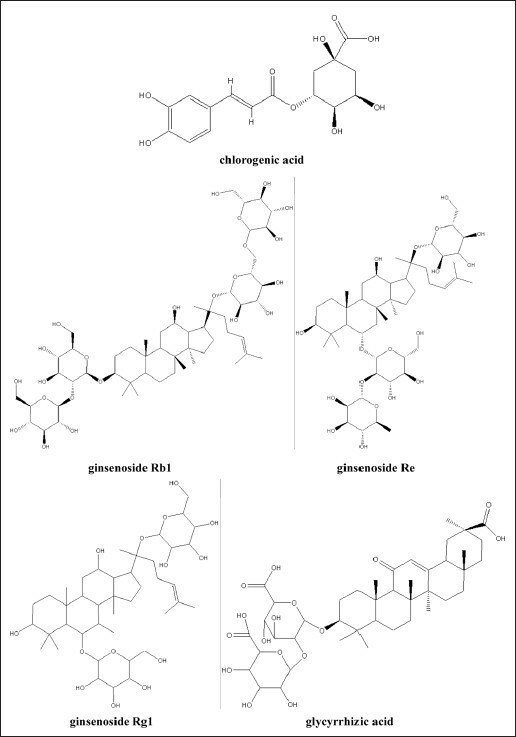 Materials and Methods: In this study, a simple and sensitive high-performance liquid chromatography coupled with diode array detection (HPLC-DAD) method was established for the simultaneous determination of five marker compounds in XDT including chlorogenic acid, glycyrrhizic acid, ginsenoside Rg1, ginsenoside Rb1 and ginsenoside Re, for quality control of this well-known traditional Chinese medicine (TCM). Results: These compounds were separated in less than 130 min using a YMC C18 column with a gradient elution system of acetonitrile and 0.1% phosphoric acid water solution at a flow rate of 1 ml/min. All calibration curves of standard components showed good linearity with R 2 >0.9991. Limit of detection and limit of quantification varied from 0.11 to 4.3 μg/ml and 0.20 to 11.6 μg/ml, respectively. The relative standard deviations (RSDs) of the intra-day and inter-day experiments were less than 4.72 and 5.48%, respectively. The accuracy of recovery test ranged from 95.0 to 105.0% with RSD values 1.28- 4.32%. Conclusion: The validated method is simple, reliable, and successfully applied to determine the contents of the selected compounds in XDT for quality control. Background: Nao-De-Sheng decoction (NDS), a traditional Chinese medicine (TCM) prescription containing Radix puerariae lobatae, Floscarthami, Radix et Rhizoma Notoginseng, Rhizoma chuanxiong and Fructus crataegi, is effective in the treatment of cerebral arteriosclerosis, ischemic cerebral stroke and apoplexy linger effect. Ferulic acid and puerarin are the main absorbed effective ingredients of NDS. Objective: To assess the affection of other components in medical material and compound recipe compatibility on the pharmacokinetics of ferulaic acid and puerarin, of ferulic acid from the monomer Rhizoma chuanxiong aqueous extract and NDS were studied. And pharmacokinetics comparisons of puerarin from the monomer Radix puerariae extract and NDS decoction were investigated simultaneously. 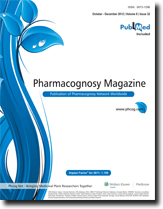 Materials and Methods: At respective different time points after oral administration of the monomer, medicinal substance aqueous extract and NDS at the same dose in rats, plasma concentrations of ferulic acid and puerarin in rats were determined by RP-HPLC, and the main pharmacokinetic parameters were estimated with 3P97 software. Results: The plasma concentration-time curves of ferulaic acid and puerarin were both best fitted with a two-compartment model. 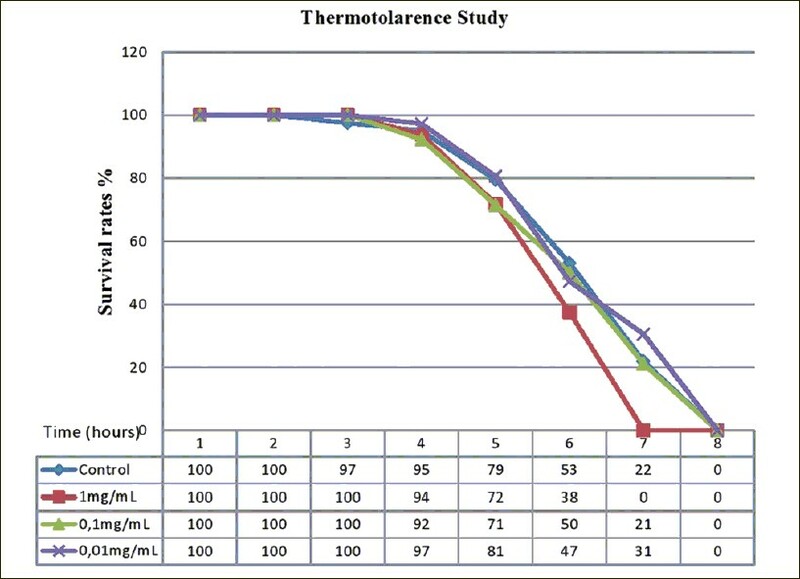 AUC 0−t, AUC 0→∞ , Tmax , and Cmax of ferulic acid in the monomer and NDS decoction were increased significantly (P < 0.05) compared with that in Rhizoma chuanxiong aqueous extract. And statistically signiﬁcant increase (P < 0.05) in pharmacokinetic parameters of puerarin including AUC 0−t, AUC 0→∞ , CL, Tmax and Cmax were obtained after oral administration of puerarin monomer compared with Radix puerariae extract. Although the changes of AUC 0−t, AUC 0→∞ and CL had no statistically significant, Cmax of puerarin in NDS was increased remarkably (P < 0.05) compared with that in single puerarin. Conclusions: Some ingredients of Rhizoma chuanxiong and Radix puerariae may be suggested to remarkably influence plasma concentrations of ferulaic acid and puerarin. Some ingredients in NDS may increase dissolution and absorption of ferulaic acid and puerarin, delay elimination, and subsequently enhance bioavailability of ferulaic acid and puerarin in rats after compatibility. Background: Drosera peltata Smith var. glabrata Y.Z.Ruan, a kind of wild carnivorous plants in the family Droseraceae, has been used for the treatment of rheumatism and bruises in Chinese folk. None of compounds in this herb has been quantified in the previous studies. 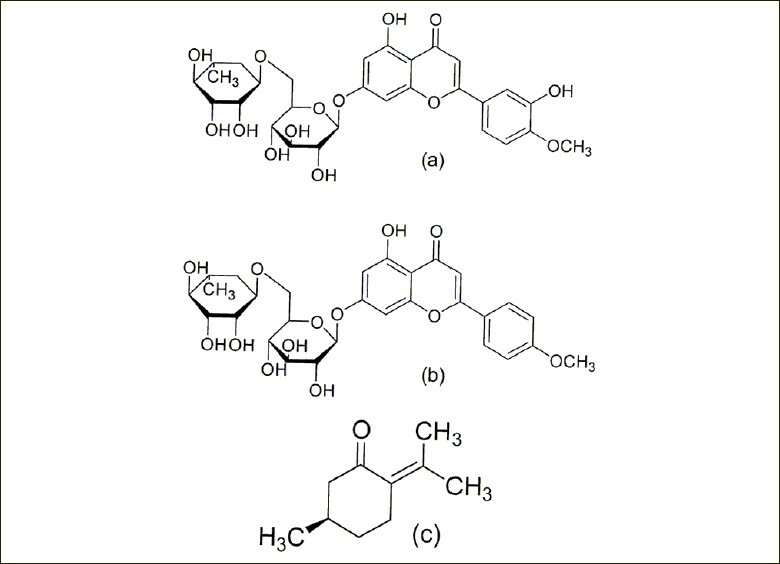 Objective: To develop a validated and reliable HPLC method for the simultaneous determination of two bioactive constituents - quercetin and plumbagin, and establish a simple UV spectrophotometry method for the analysis of total flavonoids content. Materials and Methods: Chromatographic separation was performed by using a HPLC system consisting of an Agilent Eclipse XDB C 18 column and a gradient elution system of acetonitrile and water (containing 0.1% phosphoric acid, V/V) within 20 minutes. 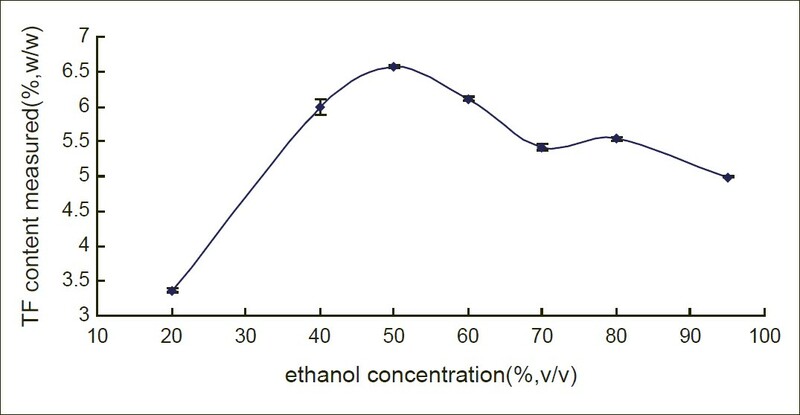 Comparing with quercetin complex with Al(NO 3 ) 3 , the total flavonoids were determined by UV spectrophotometry at 269 nm. Results: Both methods were validated for linearity (r 2≥0.9994 for quercetin and plumbagin in the HPLC method, r 2 =0.9994 for quercetin in the UV spectrophotometry method), precision (The within-day and between-day variability was less than 0.738% and 1.64% for quercetin and plumbagin in the HPLC method, and was less than 1.67% for quercetin in the UV spectrophotometry method.) and recovery (The recoveries of the HPLC method were 96.7-100.4% and 97.4-100.4% for quercetin and plumbagin, respectively, and the recovery of the UV spectrophotometry method was 96.7-99.6% for quercetin.) Conclusion: The proposed methods are simple and accurate, and could be practiced to rapidly determine quercetin, plumbagin and total flavonoids in the herbal drug, which provide effective approaches for quality control. Background: Nigella sativa Linn (Ranunculaceae) is popularly known as black cumin with a wide spectrum of pharmacological activities including anti-inflammatory, antibacterial, antifungal and antihelmenthic. The seeds are externally applied for eruptions of skin. The seeds are used traditionally for psoriasis tropicus with general pain and eruption of patches. Objective: The ethanolic extract of Nigella sativa seeds were evaluated for antipsoriatic activity. Materials and Methods: The screening of antipsoriatic activity of 95% of ethanolic extract of Nigella sativa seeds by using mouse tail model for psoriasis and in vitro antipsoriatic activity was carried out by SRB Assay using HaCaT human keratinocyte cell lines. 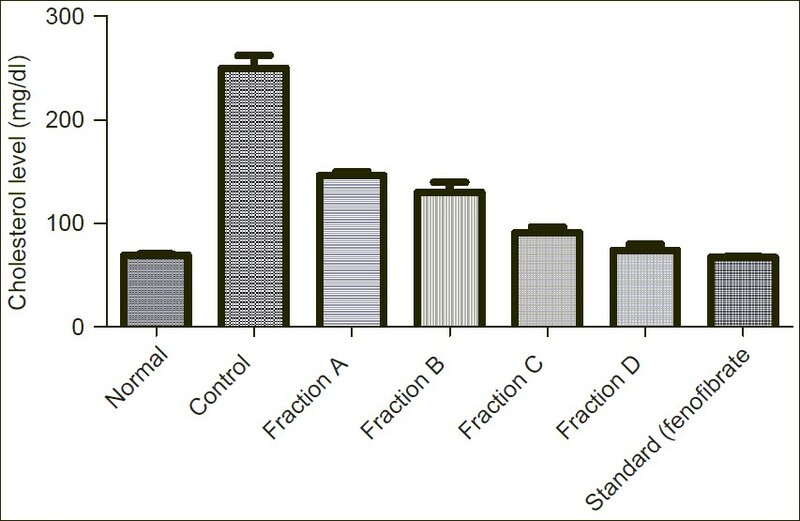 Results: The ethanolic extract of Nigella sativa seeds extract produced a significant epidermal differentiation, from its degree of orthokeratosis (71.36±2.64) when compared to the negative control (17.30±4.09%). This was equivalent to the effect of the standard positive control, tazarotene (0.1%) gel, which showed a (90.03±2.00%) degree of orthokeratosis. 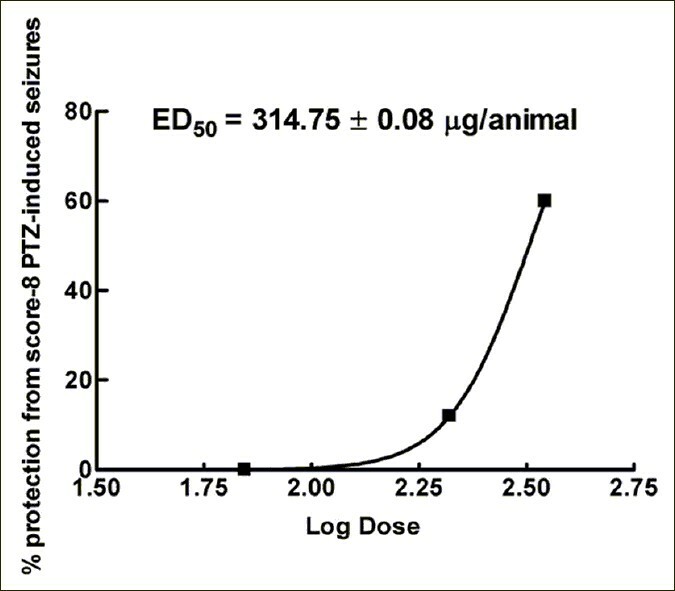 The 95% ethanolic extract of Nigella sativa shown IC50 239 μg/ml, with good antiproliferant activity compared to Asiaticoside as positive control which showed potent activity with IC50 value of 20.13 μg/ml. Conclusion: The ethanolic extract of Nigella sativa seeds also showed increase in relative epidermal thickness when compared to control group by confirming its traditional use in psoriasis treatment. Background: Buddleja davidii and B. albiflora are two different original plants of the famous crude medicine "Diaoyangchen." Materials and Methods: An ultraviolet-visible spectrophotometric method and a HPLC method were used for the determination of total and individual flavonoids (luteolin and apigenin) contents from their stems and leaves for the first time. Results: From the comparative evaluation, remarkable differences in flavonoids contents were observed between different origins and different parts of the samples. And content of specific flavonoid did not correspond to the total flavonoids contents in Buddleja davidii and Buddleja albiflora. Conclusion: With a better accuracy and precision, the methods had been proved simple, rapid, and reliable for quantitative determination of the total flavonoids and luteolin and apigenin in the two phytomedicines. Furthermore, our present study will pave the way of guidelines for the differentiation and standardization and exploitation of individual parts of this herb material. Context: As a traditional Uygur medicinal plant, Z. clinopodioides Lam has various uses in Xinjiang. Aims: A reversed-phase rapid resolution liquid chromatography (RP-RRLC) method with diode array detector (DAD) was developed for simultaneous determination of diosmin, linarin, and pulegone from Ziziphora clinopodioides Lam, a widely used in traditional Uygur medicine for treating heart disease, high blood pressure, and other diseases. Settings and Design: Compounds were separated on a XDB-C18 reversed-phase analytical column (50 mm × 4.6 mm, 1.8 μm) with gradient elution using methanol and 1% aqueous acetic acid (v/v) at 0.9 mL/min. he detection wavelength was set at 270 nm. Materials and Methods: Ziziphora clinopodioides Lam. were collected from ten different origins in Xinjiang, including the Ban fang ditch, Tuoli, the Altay mountains, Terks, Xiata Road, Zhaosu Highway, Guozigou, Fukang, Jimsar, Wulabo. Statistical Analysis Used: The intra-day and inter-day precisions of all three compounds were less than 0.89% and the average recoveries ranged from 97.4 to 104.1%. There were highly significant linear correlations between component concentrations and specific chromatographic peak areas (R2 > 0.999). Results: The proposed method was successfully applied to determine the levels of three active components in Z. clinopodioides Lam. samples from different locations in Xinjiang. Conclusions: The proposed method is simple, consistent, accurate, and could be utilized as a quality control method for Z. clinopodioides Lam. Background: Antioxidant properties of Crataeva nurvala bark contains a variety of the bioactive phytochemical constituents in medicinal plants which include flavonoids, phenolic compounds, tannins, anthracene derivatives, and essential oils. Components from Crataeva nurvala bark have been accounted to play an important role in scavenging free radicals generated by mutagens and carcinogens. Androgens are the key factors in either the initiation or progression of prostate cancer by inducing oxidative stress. In the present set of investigations, the antioxidative potential of Crataeva nurvala bark extract against androgen-mediated oxidative stress in male Wistar rats has been studied. Materials and Methods: Oxidative damage in prostate was induced in rats by the injection of testosterone (100 mg/kg body weight [bw]) for 3 days followed by injection of chemical carcinogen N-Methyl N-Nitroso Urea (50 mg/kg bw) for 1 week. The oxidative damage in prostate-induced rats were treated with the ethanolic extract of Crataeva nurvala bark (150 mg/kg bw) and testosterone injection (2 mg/ kg bw) was also continued through the experimental period of 4 months. The prostate tissue was dissected out for biochemical analysis of lipid peroxidation and enzymic-antioxidants viz. catalase, superoxide dismutase, glutathione peroxidase, glutathione-S-transferase, and glutathione reductase; the non-enzymic antioxidants viz. reduced glutathione, and Vitamin C. Results: The results revealed that testosterone administration induced the oxidative stress in rat prostate; however, in drug (150 mg/kg bw) supplemented groups, a significant protective effect of Crataeva nurvala bark against testosterone-induced oxidative injury was recorded. Conclusion: Hence, the study reveals that constituents present in Crataeva nurvala bark impart protection against androgen-induced oxidative injury in prostate. Background: Arthropod venoms have attracted interest because they represent a source of neuroactive compounds that can be useful tools in neuroscience and pharmacological investigations. Objective: The purpose of the present work was to evaluate the anticonvulsant, anxiolytic, and behavioral effects of the peptide fraction separated from venom of the social wasp. Materials and Methods: The low- molecular-weight compounds of the venom were separated by ultrafiltration and the bioassays were performed to test anticonvulsant and anxiolytic effects, as well as alterations in the spontaneous behavior of the animals. Results: Intracerebroventricular injections of the compounds induced dose-dependent anticonvulsant effects and a potent anxiolytic activity. Regarding behavioral effects, no significant differences were observed in relation to the saline control group. Conclusion: The low-molecular-weight compounds of the venom of Polybia paulista include neuroactive peptides that can be used as pharmacological resources for anticonvulsant and anxiolytic drug research. Background: In China, Atractylodes macrocephala is mainly distributed in Zhejiang province. It is, therefore, desirable to determine a reliable and accurate methodology to differentiate the samples collected from Zhejiang province. Although some studies on the fingerprints of Atractylodes macrocephala using HPLC have been published, none of them compared the processed product of Atractylodes macrocephala from different areas of Zhejiang province. Materials and Methods: Reversed-phase high-performance liquid chromatography (RP-HPLC) coupled with hierarchical cluster analysis was employed in the fingerprint analysis of Atractylodes macrocephala from Zhejiang province, China. 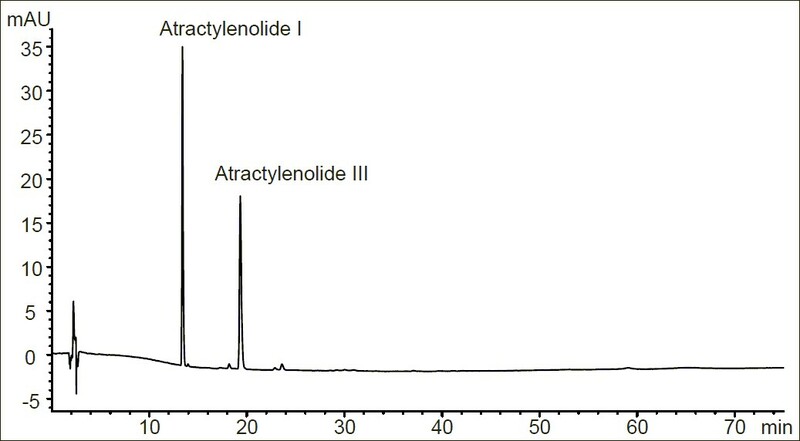 The LC assay was performed on a reversed-phase C 18 column with linear gradient elution using water and acetonitrile. The LC data showed considerable variation of chemical constituents among Atractylodes macrocephala populations. Results: 21 and 22 characteristic peaks in the 14 grants of Atractylodes macrocephala and its processed product were determined in samples from different habitats of Zhejiang province, respectively. Their chromatographic patterns were generally consistent although their contents of chemical compositions were greatly different. 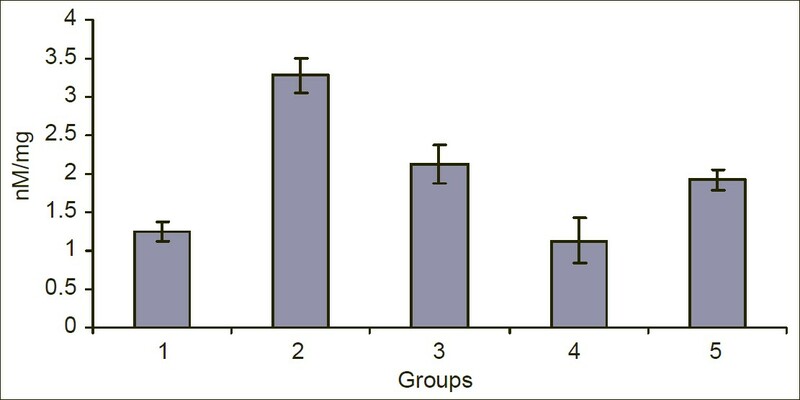 The results of hierarchical cluster analysis showed that the samples could be divided into four groups; it was able to select excellent resources from the groups. Conclusion: This was the first report of hierarchical cluster analysis of crude and processed Atractylodes macrocephala according to their chemical fingerprints and could be applied to the intrinsic quality control of crude and processed Atractylodes macrocephala. The processing technique of Atractylodes macrocephala through the pilot-scale experiment was first studied and is simple and suitable for prepared yin pian of Atractylodes macrocephala industrial manufacture. Background: The large-leafed perennial plant Piper auritum known as Hoja Santa, is used for its leaves that because of their spicy aromatic scent and flavor have an important presence in Mexican cuisine, and in many regions, this plant is known for its therapeutic properties. Materials and Methods: In the present study, we investigated the effect of hexane, chloroform and methanol extracts from Piper auritum on cell culture system and the effect in streptozotocin-induced type 1 diabetic rats treated by 28 days on the physiological, metabolic parameters and oxidative stress. Results: The hexane extract of P. auritum (HS) treatment significantly reduced the intake of both food, water and body weight loss as well as levels of blood glucose, serum cholesterol, triglycerides and increase HDL-cholesterol. After 4-week administration of HS antioxidant enzyme as SOD, CAT, GSH, GPx in pancreas were determined. These enzyme increased significantly compared with those of the diabetic rats control and normal animals. For all estimated, the results of HS treated groups leading to a restoration of the defense mechanism. The treatment also improves pancreatic TBARS-reactive substance level and serum NO and iNOS. To determine the insulin releasing activity, after extract treatment the serum and pancreatic sections were processed for examination of insulin-releasing activity using an immunocytochemistry kit. The results showed that administration of the hexane extract (200 and 400 mg/kg) exhibited a significant increase in serum and pancreas tissue insulin. Administration of streptozotocin decreased the insulin secretory activity in comparison with intact rats, but treatment with the HS extract increased significantly the activity of the beta cells in comparison with the diabetic control rats. The extract decreased serum glucose in streptozotocin-induced diabetic rats and increased insulin release from the beta cells of the pancreas. In cultured RIN-5F cells, we examined whether hexane extract of P. auritum would protect the pancreas-derived β-cells from oxidative stress. Moreover, HS could protect pancreatic β-cells from advanced glycation end products-induced oxidative stress. Conclusion: From these results, HS is suggested to show anti-diabetic effect by stimulating insulin-dependent and by protecting pancreatic β-cells from advanced glycation end products-induced oxidative stress. Background: Hyperlipidemia is implicated as the cause for coronary heart diseases. Though varieties of synthetic drugs are used in the treatment, still the searches are on for better medicaments especially from the plant kingdom. Many medicinal plants have been studied in this context but most of them are seasonal or have restricted availability. One such weed, available throughout the year is Salvadora oleoides (decne.). Materials and Methods: Column chromatographic fractionation of the butanol fraction of leaves of Salvadora oleoides (decne.) yielded four fractions (fraction A-D). All sub-fractions were tested for their anti-hyperlipidemic activity. Fractions were administered at a dose of 65 mg/kg (oral) to the Triton WR-1339 induced hyperlipidemic rats. Results: Sub-fraction D showed maximum significant reduction (P<0.05) among four sub-fractions in comparison with standard drug fenofibrate. Conclusion: Further studies on the isolated fractions and constituents are needed to isolate compound responsible for activity and elucidate the mechanism by which Salvadora oleoides (decne.) exerts protective effects against hyperlipidemia. Background: The antiproliferative activity of Salvia species grown in Jordan has not been fully evaluated yet. The aim of this work was to study the antiproliferative activity of crude ethanol extracts from nine Salvia species grown in Jordan against a panel of breast cancer cell lines. Material and Methods: Cytotoxic activity was evaluated in human tumor models of breast cancer; MCF-7, T47D, ZR-75-1, and BT 474 by the sulforhodamine B assay. In addition, the extracts were evaluated using a non-transformed cell line (Vero) and normal fibroblast cells in order to demonstrate their selectivity and safety. Results: From the nice ethanol extracts under investigation, those of S. dominica and S. fruticosa showed an inhibitory concentration of 50% of cells (IC 50 ) in concentrations less than 30μg/mL against the four cell lines under investigation. S. syriaca and S. hormium showed an IC 50 below 30μg/ml for two out of the four cell lines. S. fruticosa, S. hormium and S. syriaca showed selectivity in their antiproliferative activity against estrogen receptor positive cell lines with minimal toxicity against normal human periodontal fibroblasts. Phytochemical screening using thin layer chromatography indicated the presence of terpenoids, flavonoids and coumarins in all examined extracts. Conclusion: Three of the plant extracts under investigation exhibited antiproliferative activity against breast cancer cells and were shown to be safe and selective. These could be considered as a potential source for novel anticancer therapy. Background: The beneficial effects of antioxidants in plants are mainly extrapolated from in vitro studies or short-term dietary supplementation studies. Due to cost and duration, relatively little is known about whether dietary antioxidants are beneficial in whole animals' life span or not. Materials and Methods: To address this question, under heat stress (35°C), Hypericum perforatum was extracted with petroleum ether and the nematodes Caenorhabditis elegans exposed to three different extract concentrations (1mg/mL, 0.1mg/mL, 0.01mg/mL) of H. perforatum. Results: We report that Hypericum perforatum extracts did not increase life span and slow aging related increase in C. elegans. Moreover, one fraction (1mg/mL) increased declines of C. elegans life span and thermotolerance. Conclusion: Given this mounting evidence for life span role of H. perforatum in the presence of heat stress in vivo, the question whether H. perforatum acts as a prooxidant or an antioxidant in vivo under heat stress arises.